These coils will bring your GS Air 2 tank back up to speed with their ability to make vaping great again. These coils are made from high-quality material that will make your tank feel as if you just bought it brand new. The cotton is organic cotton that may become pretty fluffy if treated and handled right. The recommended wattage for this coil is about 8W to 25W, and the recommended voltage is 3.5V to 5.5V. These properties will allow you to get the right power so that the cotton gets heated up and start giving you your e liquid flavor and vapor. It has a resistance of 0.75ohm so it can make you get enough heat to enjoy vaping. 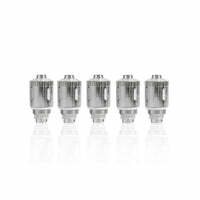 These coil heads are going to last you a long time especially since it is coming in a pack of five. It will probably take you a long time before you start wondering if you should get more soon. Help your tank get a little refreshed and get these coils to make you vaping be as excellent as can be. Hesitating to get these for your tank will only delay you enjoying your e liquids in their entirety because a fresh coil equals happy vaping.